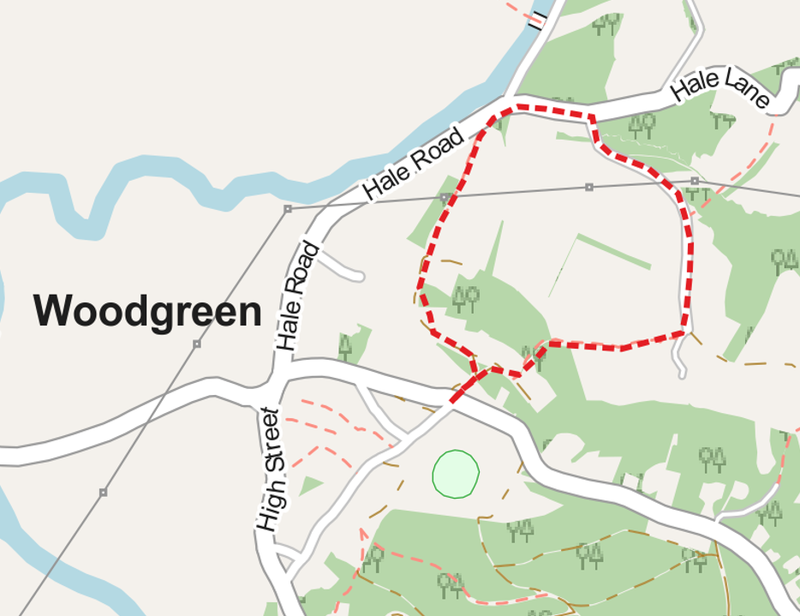 A short walk of 1.5 miles starting at the postbox on Woodgreen Common. The route passes through Densome Wood (excellent for bluebells in early May), continuing to Higher End Farm (passing a Tulip Tree – in flower from mid-June) and then returning along Higher End Lane (stop and admire the old bridge) and the Avon Valley Path. This area was originally part of the Hale Park Estate. Both the farm and Densome Wood were sold during the 1920s and 30s with the latter being developed for housing as more townsfolk began to move to the country. Start/End Entrance to Densome Wood opposite post box (Avon Valley Path sign). Right at junction Take the gravel track to the right. After 40m, take the footpath on the left between the houses. Bluebell Wood Follow the path down to the stream and then up to the gate into the field. Field Cross the field with the fence on your left. Go over the stile on the left into the next field. Tulip tree field Cross the field diagonally keeping the trees on your right side. At the far end, there’s a stile out onto the track. Bear left down the road. Hale Lane After crossing the bridge, bear left at the junction down Hale Lane. Hale Road Bear left at the junction and after 40m bear left again up a track and crossing a stile back onto the Avon Valley Path. Avon Valley Path Cross the fields keeping the fence on your right side. Take the stile out of the field onto the track. Lower Densome Wood Continue up the track and bear right at the top returning to your starting point.